Dyffryn Ardudwy Burial Chamber (Cadw)0300 025 6000work Historic SiteThis double burial chamber, is considered to be one of the earliest examples of its kind in the British Isles. Believed to date to around 3500 BC, it is one of several such sites close to the village of Dyffryn Ardudwy. Originally covered by a large cairn of stones, the present monument consists of two exposed chambers with entrances facing east. Excavations carried out in the 1960s discovered numerous fragments of deliberately broken Neolithic and Bronze Age pottery, suggesting that the site was in use over a long period of time. This double burial chamber, is considered to be one of the earliest examples of its kind in the British Isles. 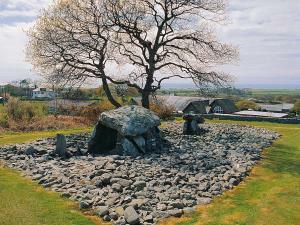 Believed to date to around 3500 BC, it is one of several such sites close to the village of Dyffryn Ardudwy. It is possible that Dyffryn Ardudwy’s proximity to the sea connected its people to other communities who shared their tomb building traditions. They were part of a wider culture, and similar tombs have also been found in South Wales, Ireland, western France, Portugal and Spain. Entering Dyffryn Ardudwy from the south on the A496 from Barmouth, the Burial Chamber is signed to the right.